Taking up the mantle to study medicine requires a special kind of person, with even fewer having the grit and ability to take up emergency medicine. When members of your community need support and answers to their health issues, it’s these trusted professionals that step up during times of need. Choosing a career in medicine can lead you down many paths, but when you’re starting off your career, how can you know which will offer you the best in experience, interest, opportunity and impact? Take a closer look at how a career in emergency medicine can open up doors and lead you to an amazing career future. In addition, the demographics of your patients will be broad. One minute you could be looking after a child with a suspected bone fracture, the next minute – an elderly patient needing pain management. The demands on your skills and knowledge will be high, but if there was any career path that will make you use and retain the wealth of information gathered through study, this is the job for you. Patients and their families who present at emergency departments are often dealing with complex emotions that swing from distress through to guilt. In tandem, your support team will also be faced with a combination of demands and stresses as they manage patient personalities and expectations. Where else would you find a more perfect environment to hone your existing crises management and leadership skills? A medical professional who can maintain their calm disposition and clear communication skills, as they discuss options with patients and colleagues will not only reduce stress levels, but will build long term rapport. Few challenges in a professional’s career come as close to the hectic, variable and against-the-clock environment like that of an emergency department or clinic. A career in this sector is not for the faint of heart, but the professional development a practitioner experiences can add years in maturity and skill. One of the biggest obstacles a new medical professional has to overcome is making sure that they follow a career path that is as enriching as it is rewarding. With so many different career paths available, and some interests not piqued until later in life, there is a huge fear of becoming pigeon-holed early. This is where experience in emergency medical support can really help you develop your career. While some medical professionals fall in love with emergency work and remain in it for the majority of their career, for others emergency medical experience offers an opportunity to get exposed to different specialist skills. From paediatrics and infectious disease management through to cardiology, the emergency department presents opportunities to delve into a host of unusual and highly skilled medical conditions without ever leaving the treatment floor. Furthermore, when you work with such a variety of patients, there is natural scope to meet and network with specialists in the fields that interest you. There’s no underestimating the importance of getting career and study advice from those who have trodden that path, and your value as a medical professional in an emergency context will not go ignored. Head hunters are meticulous when it comes to finding appropriate candidates for positions, and having some big-ticket placements is a sure fire way to prove your commitment, expertise and worth. Doing the ‘hard yards’ and honing your skills and knowledge in a complex and fast-paced environment places you at the top of the pack for future opportunities. It demonstrates your commitment, passion and ability to be unflappable in even the most stressful of situations. In turn, a candidate that has not yet demonstrated the ability to manage competing demands in such an environment may be overlooked when going for promotions or new positions – as they may be seen as ‘unproven’ in the field. 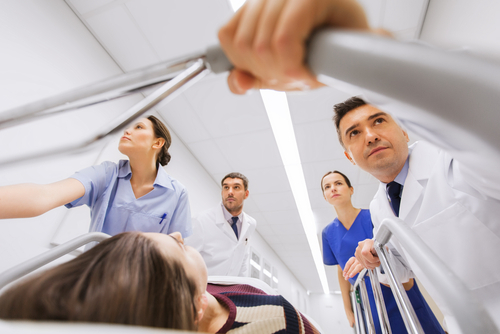 If you want to build your career, a placement in an emergency department is a helpful and rewarding step to pushing you beyond your comfort zone. Being calm under pressure and decisive in the workplace has other benefits too – they can help you make informed decisions outside of the workplace. Many career health professions take additional roles as directors and consultants for other organisations – and it isn’t just because of their medical expertise. These abilities are desired transferable skills that are helpful to many organisations, and can help you create multiple lines of income without you ever having to step into another clinic or treatment floor. Helping patients recover from injury and illness has many rewards; but the not-so-obvious result is that it can encourage you to become more invested in the issues that affect your patients the most. You can have an immense impact on your neighbourhood, and it doesn’t always have to be as the First Aid Officer for your child’s basketball team. Whether it’s volunteering your skills to the local underfunded sporting club, through to campaigning for better access to support services, the opinions and actions of our community’s medical professionals carry weight. The experience of an emergency medical professional carries additional importance as you are among the front line in witnessing and managing flaws in systems – and that understanding and expertise is vital for communities making healthy changes.